Trying to make your front entrance more attractive or just have a dark spot with a high ceiling. A decorative outdoor electric hanging lantern will make your home shine to those entering and passing by. This type of fixture adds to the curb appeal of your property and will make a great first impression to all that visit or drive by. Lets look at several examples and see how difficult it is to install one of these fixtures. 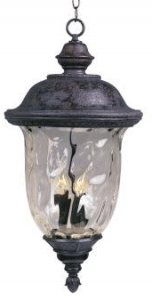 This fixture is die cast aluminum and has a Oriental Bronze finish. The rippled finish on the glass will give you a lot of light and will look amazing from the street. The illumination will be more outward than down because of the closed lower part of the fixture. The unit uses three candelabra base bulbs with a maximum of 60 watts. The bottom of the fixture and the globe has to be removed to change the bulbs. The fixture is 24.5 inches tall and 12.5 inches across. It comes with a 6 foot chain for hanging. Can be installed in any wet location. Weighs 11 pounds, make sure your electric box will handle the weight. The Quoizel fixture is made from Brass with a Mystic black Finish in a craftsman design. The Clear Beveled Glass will give a large amount of light. The bottom of this fixture is open and you will get some light under the fixture. A rounded metal band will separate the bottom and top glass openings. Three candelabra based bulbs with the maximum of 60 watts each will be needed. The lower globe will need to be removed to change the bulbs. The fixture is 21 inches tall and 12.5 inches wide. It comes with 12 foot of wire and 8 foot of chain for hanging. The fixture weighs 15 pounds. The cast aluminum frame with a durable powder coated finish is available in three finishes (Matte Black, Matte White and Rust). The square grid cage with 5mm thick beveled glass with look great in your entryway. The open bottom will allow plenty of light to shine down. The single medium base bulb has a maximum of 100 watts. The open bottom will make bulb changing a snap. The fixture is 11 inches tall and 6 inches square. It includes 3 foot of chain and 6 foot of lead wire for hanging. It is the lightest weight in this article at a little over 4 pounds. Can be used in wet or dry locations, you can hang in a tall hallway or stairwell inside. For California residents this fixture is Title 24 Compliant. Looking like an old fashion turn of the century lantern, this fixture is made of metal with a Coffee Bronze finish. The crackled glass will diffuse the light. The bottom of the fixture is closed, this unit will not shine much light downward. The single medium based bulb with the maximum of 60 watts will be required. The lamp will have to be disassembled to replace the bulb. The fixture is 16 inches tall and 8 inches across. It does not specify anywhere how much chain or power cord lead you will receive. It is light weight at only 4 pounds. The die cast aluminum fixture comes in two finishes (Black and a Rust Patina). The curved clear glass will allow light to shine 360 degrees around. The bottom of the fixture is closed, you will not get any light straight down, be careful of dark spots. The four candelabra bulbs with a maximum of 60 watts each will illuminate your area. The globe will have to be removed to change the bulb. The fixture is 26 inches tall and 11 inches wide. At almost 12.5 pounds, this is the heaviest fixture in this article. It will include 12 feet of lead wire and 6 feet of chain for hanging. It can be used in any wet or dry location. This type of fixture must be connected to a switch for turning on and off, there will be no pull chain or other form of power switch in this fixture. You can use a dimming switch for light control if you use a dimmable bulb. Having a electric supply box already installed in the ceiling will be a big help. If you do not have one, consulting with a qualified electrician will be the best bet. They will know all of the local codes and how to best run your lead wire for power to your fixture. If you have an existing fixture or just a box, follow these simple steps. First is safety, make sure that the power has been turned off for your install location. Use the following steps for removing the old fixture. 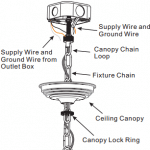 Remove the canopy that covers the electric box, undo wire connections and remove fixture chain from mount. Installation is the reverse of removal. make sure that you use the mounting hardware for the new fixture as some parts do not interchange. When connecting the wires, make sure that you connect color to color(Black is power supply, White or ribbed is neutral and Green or bare is ground). When testing for the height of the fixture, you can extend the chain by purchasing additional chain at your local hardware store. You may need to test the amount of illumination that you get at different heights so that you can determine what gives you the best lighting coverage for the fixture that you have chosen. When looking to light your entryway, you have several options. These decorative outdoor electric hanging lantern style of lighting will make your entryway something to be proud of and you will get many compliments on them. All you have to do is find out what kind of fixture will work for you. Thanks for reading and if you have any questions or comments please use the form below. Very informative John. Since my family is still working on finishing our home we have not yet thought about how curb appeal will look. Its nice that you show so many different options. Curb appeal will not only come from lighting, it helps though. Many options are available, many will work for each location. Your Post makes this kind of decision so easy. I need to do some remodeling soon – I will keep this in mind. Many people when they remodel their home do not look at their outside lights. This is the first thing that a guest will see especially at night. If the entryway to your home is warm and inviting, your guest will feel more comfortable. I agree that lighting your entrance door can transform the front of your house, but also it provides much needed light when visitors knock. There are some nice designs you have included in this post and you did not forget the installation information and like you say it is always best to consult an expert, thanks. Not all designs will work in all locations. Some of these fixtures have different illumination patterns. You first have to choose what style of lighting will work in your home before you look at the fixtures. The wrong type of light will make things look very bad. Installation is not hard if you remember to turn the power off first. What a great review! I think lights outdoors make a huge difference in how a house looks. You offered some great looking lights! As a beginner, who knows nothing about wiring lights, do you think I should attempt the install myself? The directions seem simple enough. Or do you recommend hiring an electrician if I’ve never done this before? If you are replacing an existing fixture, just follow the instructions and you should be OK. If it is a new installation, I would at least consult a qualified electrician. Yes the outside lighting does make a big difference in the street appeal of a property. When you try to sell, the first impression that a buyer gets is how the property looks from the street. Mood is an important thing when looking at outdoor lighting. If you are choosing Path, entryway, flood or just lighting up you deck for that outdoor barbecue, many styles are available. Looks like you have given this a lot of thought. Curb appeal is something I haven’t thought of too much. Great post. Giving your home curb appeal should not be a subject that gets little thought. Your guest will enjoy visiting if they are given a warm welcome when they enter your home. Curb appeal is another item that many forget. If you try to sell your home, many will drive by after dark to see what the property looks like at night. Having the proper lighting will go a long way in selling your home. I love lanterns for so many reasons but have never considered hanging one in my entryway before. On reflection though I really like the idea and there is something just so quaint about it (if using the right style of course) and sounds silly but there is something very medieval and rustic about it which I love. Gives a lot of character much more than the normal standard automatic lights people have. Great article.. thanks! This style of lights adds a lot of style to an entrance way. Your home will have a elegant look with a hanging outdoor lantern in your entryway.